Goblin Valley State Park, Utah – May 2015 A fellow camper told me about a boondocking area outside Goblin Valley State Park. I arrived on a Sunday afternoon and most of the people there were packing up. There are tons of trails here where people can ride ATVs and dirt bikes. Most of the campers that I’ve seen come and go this week had one of these large toys. It has been a great location, totally free, and mostly quiet. Right outside my front door are white sandstone monoliths which I’ve climbed several times during my visit. Here is a view of my campsite from the road to the state park. You may have to zoom in where the arrow points to see the campers. There are many other possible campsites in the area down dozens of dirt roads but I was happy with this big gravel parking lot just off the paved road. The obvious draw here is Goblin Valley State Park. It was a very short drive from the visitor center to the end of the road and a scenic overlook. And I thought “is this what I paid $10 to see?” But a walk down in to the valley full of strange looking hoodoos changed my perspective. It really is a fascinating place. It is also impossible to give it justice in photographs but here’s my best effort. It is easy to let your imagination run wild in this place and see the forms of fanciful castles, goblins, dragons, and other whimsical creatures in the strange landscape around you. I enjoyed a great hike nearby, my favorite so far this year. Wild Horse Canyon is next door to the state park and impossible to miss if you are visiting Goblin Valley. There is no fee to visit. 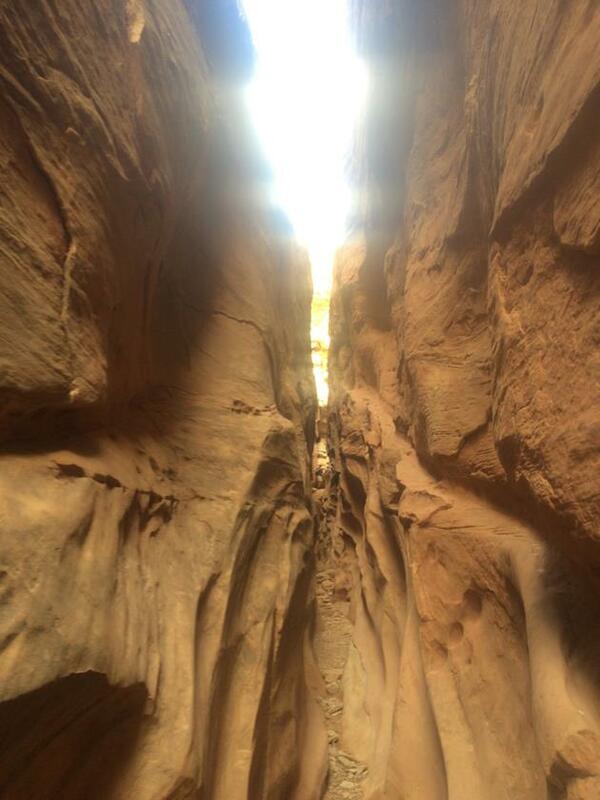 It is a very popular hike of a slot canyon because it is accessible to all skill levels. It doesn’t require any special climbing abilities to traverse. It’s about a half mile down a wash where you have to climb a bit to get around an obstacle, and then you are at the beginning of the canyon which is about 3 miles long. Sometimes it gets a little tight in the canyon. This is a pic of one such place. That skinny sandy path scattered with rocks is what you have to walk on and sometimes you have to lean hard left or right to squeeze through. Even on a Tuesday afternoon with rain threatening this place was crowded. I saw at least 30 other hikers and often had to wait for a group to pass before making my way down a narrow section. This would have normally diminished my enjoyment of the hike. But this particular hike was well worth battling the hordes. This hike is often hiked with nearby Little Bell Canyon for an 8 mile roundtrip. I first planned to stay at this camp for a week. But there was zero cell service for a 20 mile radius of my camp and I had a couple business transactions in the works that I really needed to be reachable for so I decided to leave after 3 days. The night before I planned to leave a group of a dozen campers pulled in about 5pm. They circled their wagons at one end of the parking lot. Not a single camper had solar panels. I fell asleep to the drone of their generators thankful I was packing it in in the morning.